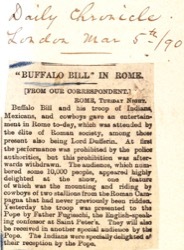 Buffalo Bill and his troop of Indians, Mexicans, and cowboys gave an entertainment in Rome to-day, which was attended by the élite of Roman society, among those present also being Lord Dufferin. 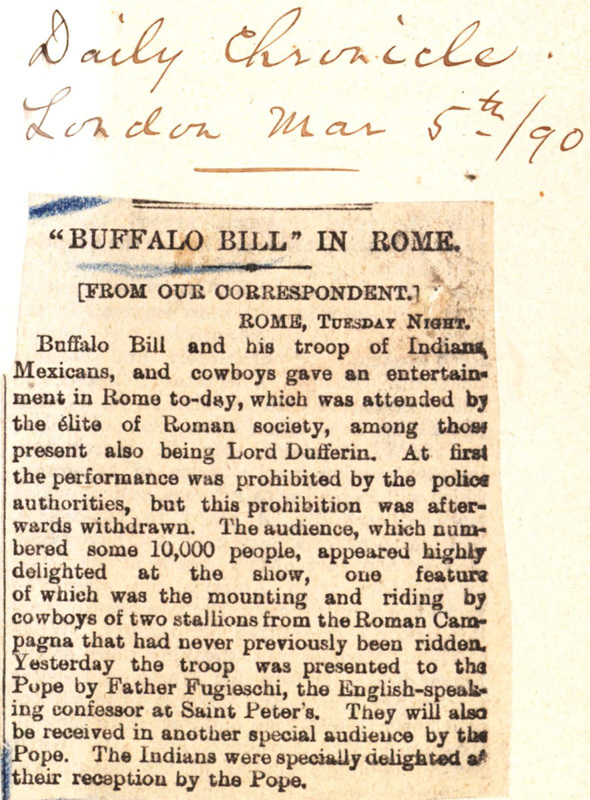 At first the performance was prohibited by the police authorities, but this prohibition was afterwards withdrawn. The audience, which numbered some 10,000 people, appeared highly delighted at the show, one fature of which was the mounting and riding by cowboys of two stallions from the Roman Campagna that had never previously been ridden. Yesterday the troop was presented to the Pope by Father Fugieschi, the English-speaking confessor at Saint Peter's. They will also be received in another special audience by the Pope. The Indians were specially delighted at their reception by the Pope.